Well we are ready to go home. 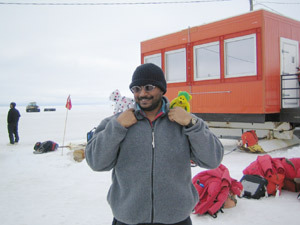 Here we are with our team member, Pannir Kanagaratnum, out at the Pegasus blue ice runway waiting for our jet to take us back to New Zealand. 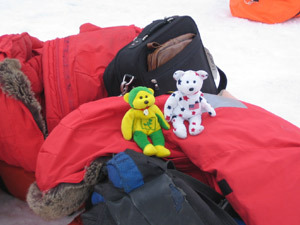 We will return our Antarctic clothing to the Antarctic Center in Christchurch, NZ and spend the night at a hotel. Then we will fly back to Auckland to begin our trip back home. Some of our team have already gone home and others will spend a little extra time vacationing in New Zealand. 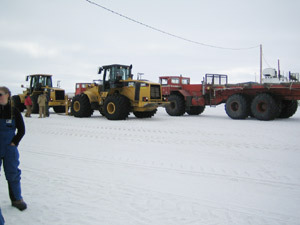 There's lots of heavy equipment out here at the ice runway. Some of it is for maintaining the runway and some is used for moving cargo. We made a movie of one of the trucks that had gone out to the runway before the plane came in. Here's our plane just landing. It's a C17 Starlifter and doesn't have skis. We waited about an hour out at the ice runway. 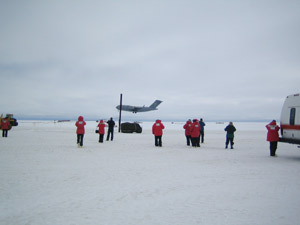 There is a building here at the runway, but we preferred to wait outdoors and savor our last views of Antarctica. 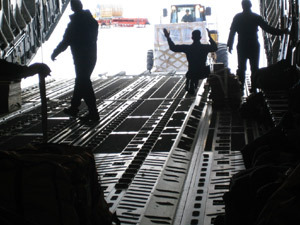 Once we got on the plane, we got to see them load the cargo. They bring it up to the back door on a forklift and put it on this wheeled track that moves it into the plane. The guys inside help the forklift operator put the cargo in just the right spot and then help move it along the track It's very interesting to watch because then they put a big net over it all and use huge hooks to fasten the cargo to the floor. We had to wait on the plane for about 2 hours. 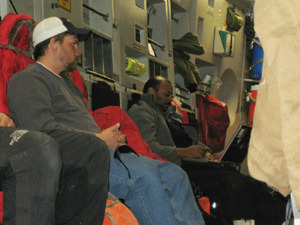 One of their navigational systems wasn't working right, so they had to fix it before we could take off. We were sitting between Joel and Pannir, our team members, so you can't see us in this photo. 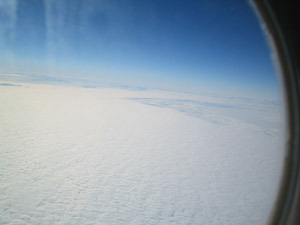 Our last view of the Ross Ice Shelf just before we take off. Goodbye, Antarctica.